Currently in the US, about 1 in 3,300 people live to be 100 years old. That translates to about 0.03%. France has a slightly higher percentage, and Japan a bit lower. And those are the leaders worldwide. So, closer examination of the lives of these individuals is indeed a worthwhile exercise. We can learn a lot from them. And we most certainly ought to celebrate this most significant accomplishment. On September 18th, 2011, Kelsie Clinton Henry Buller, Sr. Esq. will join the Centenarian Club. With less than 90 days to go, the excitement is beginning to build. And, as we continue the countdown, this is perhaps the most appropriate moment to highlight the life and times of our very own matriculating member of that prestigious club. Almost 100 years ago, in what was then Stann Creek Town, Kelsie Clinton Henry Buller made his first appearance on this physical plane. Born to Rachel Alberta Malone and Henry Aguedas Buller, he was almost immediately at a disadvantage, for he did not have the benefit of a stable home and the traditional family unit. 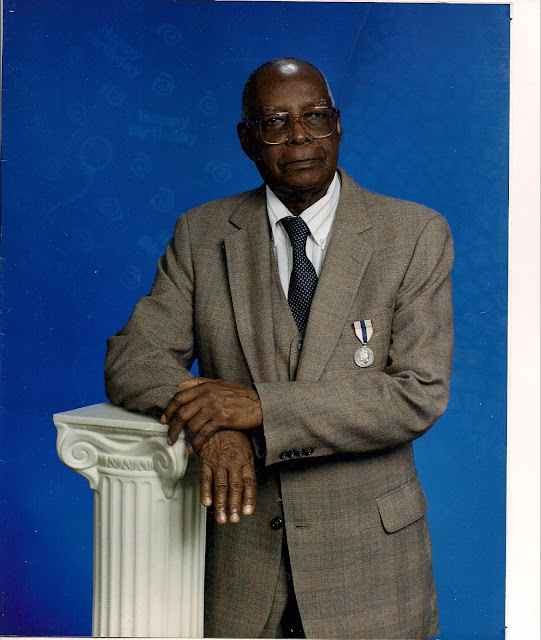 His early childhood years were spent with his grandparents in the Village of Mullins River, where he distinguished himself by finishing at the top of his primary school graduating class. But the odds were against him, and even that accomplishment was insufficient to earn him a secondary school education. Instead, he would work in his father’s store for the next several years before being sent away yet again. His late teen and early adult years were spent working in his uncle’s saloon in the then capital city of Belize. And this was when he began consciously taking control of his destiny. The $3.00/week he was earning did not leave him much choice. Determined to continue his education, he enrolled in his first correspondence course. Fate would eventually return him to Stann Creek Town, where he assisted his father with the store and a citrus orchard, before taking over when his father passed at age 61. This was not a good time. Newly married, raising a family and now having to deal with the harsh reality of an almost bankrupt business he inherited, it would have been understandable if he had not been the least bit successful. But to him, this was simply the latest set of challenges he needed to overcome. And he set about doing so in methodical fashion. Before long, he had rebuilt the business, acquired a second citrus orchard as well as additional income properties, become the agent for Maya Airways, functioned as Shipboard Inspector for outgoing banana shipments, taken on the position of Superintendent of the Fire Brigade, owned a football team, sponsored a winning candidate in the Queen of the Bay beauty pageant, been elected Chairman of the Citrus Growers Association and traveled to London to represent the association, served as an elected member of the Stann Creek Town Board, married Doris Fairweather with whom he fathered six of his nine children and rebuilt both the store and the home after one was destroyed and the other significantly damaged by hurricane Hattie in 1961. Many of these were accomplished simultaneously – very significant for someone with such humble beginnings. Yes, he had become a pillar of the society. And he was recognized and rewarded with two commissions. The first was Justice of the Peace. The second was Commissioner of the Supreme Court. Today, he is the oldest living Commissioner of the Supreme Court of Belize. In the late 80’s he migrated to the USA to be with his children. And it was there, at age 70, that he first decided he wanted to live to see 100. He set out to accomplish this task with the same determination and diligence as all previous challenges and objectives. This is one of the most difficult objectives to achieve, as evidenced by the tiny percentage of people who actually reach that milestone. There are numerous problems to overcome along the way. In the last few years he has lost his sight and some of his hearing. He forges ahead despite these setbacks. Most importantly, he is of sound mind. We sincerely hope and pray that Kelsie will achieve his objective of becoming a Centenarian. We count down the days with every confidence that he will make it. And we look forward to celebrating this momentous occasion with him. It is a great honor to spotlight this outstanding Belizean who is about to become a centenarian. I am praying for you Mr Buller. A great Belizean Mr. Buller!! What a great inspiration for our young people and future generations to follow. Wow....this is very interesting. Hope that I could live that long. God Bless him!